Take the hard boiled eggs and make slits on them. Coat them in a mixture of turmeric, salt and red chili powder. Fry them in 1 tsp of oil. Take out, when nicely fried. Next add the turmeric, chilli, salt mixture to the cubed potatoes and fry them in this oil. Take out, when 3/4th fried. In a deep bottomed vessel, take 2 tbsps of mustard oil. Heat it, then add a bay leaf, 2dried red chilies and a tsp of cumin seeds. Once the cumin seeds splutter, add the sliced garlic and fry for a min. Take care not to burn the garlic. Add a tsp of sugar in the oil. Next add the sliced onions and keep on frying till they change color and become light brownish. Next add the slit chilies. Next add 2 tsps of Kashmiri chilly powder and the yoghurt. Add 1 tsp of Dhania-jeera powder and fry well, adding a little water and fry till oil starts to separate. Once oil starts to separate, put in the fried eggs and potatoes and mix. Add little Water for gravy, and salt to taste. 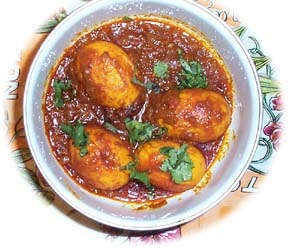 Once it comes to boil and potatoes are cooked, add ½ a tsp of garam masala. really tasty and authentic. Thanks.